Setting the standard for light transmission and resolution, the GS 52 GA ED offers a practical and versatile alternative to larger heavier telescopes in situations where size and weight are an issue. 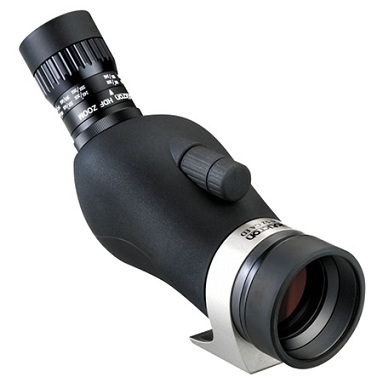 Fitted with the HDF T 12-36x eyepiece set between 12x and 18x, images are exceptionally bright with a large depth of field - perfect for either hand held or tripod mounted observation at close range. Unlike most other telescopes of similar size, the full size prism units allow the instrument to retain its performance right up to 36x, delivering superior colour fidelity for longer range viewing even in comparatively low light. Images are not just brighter they are sharper too and the GS 52 GA ED compares well with the GS 665 GA for resolution at magnifications up to 30x. For garden birdwatching and photography close focus is just 2.5m. Fully rubber armoured and nitrogen gas filled for protection against the elements, the models are fitted with a lightweight magnesium tripod sleeve offering -/+ 90° rotation for easier positioning when viewing from the confines of a hide or vehicle.